Northwestern takes the initiative against Wisconsin. The Wildcats were able to foray outside the Big Ten over the weekend and came away with a pair of victories. For coach Drew Pariano, a win is not a win. He can earn a W and not be content with the performance. But this weekend, in Northwestern’s final two matches of the regular season — George Mason and American on the road in Washington D.C. — he was satisfied. First the Wildcats (12-8, 2-7 Big Ten) went toe to toe with the Patriots and didn’t lose a single bout they competed in. 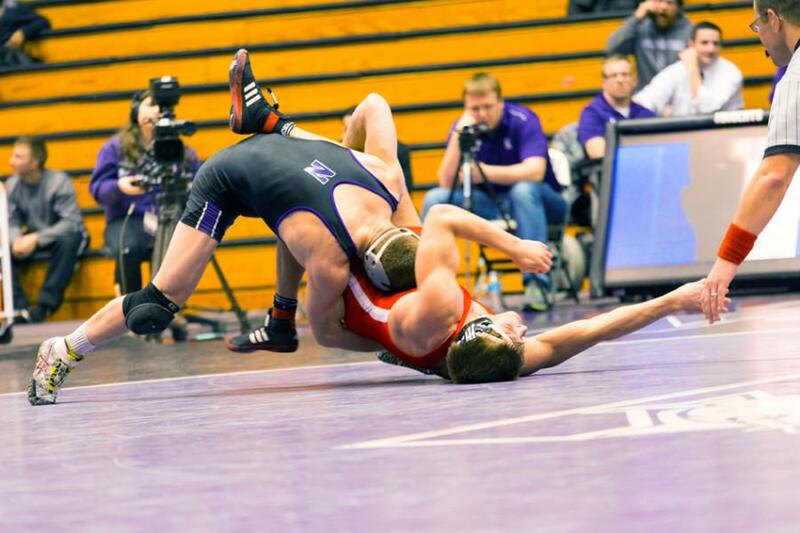 Forfeiting two matches at 157 and 174 pounds, NU won every other weight class for a 31-12 victory overall. Juniors Garrison White and Jameson Oster at 125 and 141 pounds respectively won by major decision, senior No. 18 Alex Polizzi at 197 scored a tech fall and senior No. 3 Mike McMullan at heavyweight earned a fall in 55 seconds. Clearly, moving away from Big Ten competition helped the Cats get back on track. “It puts the guys in the right frame of mind,” Pariano said of this weekend’s victories right before the Big Ten Championships. After the Cats put on a show at George Mason, they headed right to the bus for their second dual against American. But the weather wasn’t cooperating. Ultimately, NU made it safely and the dual meet went on. Now that the Cats had two wins — one over George Mason and one over the weather — they were ready to fly home undefeated. With the 28-20 victory over American, they accomplished that goal. The meet wasn’t as close as the score indicated. NU won six of the eight total matches, including two by tech fall and two by fall, but the two forfeits gave up 12 automatic points. McMullan pinned his second opponent of the day, Polizzi upped his tech fall against George Mason to an actual fall against American and No. 7 senior Pierce Harger at 165 and No. 3 sophomore Jason Tsirtsis at 149 both turned in more dominant performances than their first times out with tech falls. Junior No. 20 Dominick Malone at 133 and Oster both also won their second matches of the day. Pariano cited McMullan, Polizzi, Malone and Oster as having particularly good weekends. Only White and redshirt freshman Mitch Sliga at 184 lost at American, with White suffering a tech fall to a ranked opponent. Now, the Cats return to Evanston, riding a three-match win streak, and have an extra week to prepare for Big Ten Championships, which start on March 7.